Congress almost passed a measure this week that would have forced the Trump administration to keep sanctions on companies partly owned by a Kremlin-linked Russian billionaire. The sanctions bill was seen in some quarters as a chance to stand up to President Trump and portray him as too cozy with Russian leader Vladimir Putin. If that’s what the opportunity was, no member of Alaska’s congressional delegation took it. 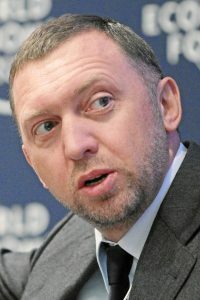 Oleg Deripaska is tight with Putin, and he controls one of the world’s largest aluminum companies, and two other firms. Or he used to. “This is one where … I’ve gone back and forth because the fact of the matter is, we’re dealing with just a bad actor and I don’t think he has changed his stripes,” she said. Young’s office, in a written statement, gave reasons similar to the senators.’ His statement also said the Russian companies made big changes to get off the sanctions list, agreeing to things like regular audits and new boards of directors. Why, the statement asks, would anybody comply with U.S. sanctions demands if Congress won’t let a president lift them when the demands are met?